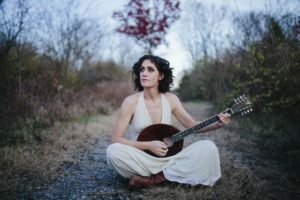 The Secrest Artists Series will present composer, singer, violinist Jenny Scheinman in a multi-media performance in Brendle Recital Hall on Jan. 24 at 7:30 p.m. Doors will open at 7 p.m.
Scheinman and her accompanying musicians will create a living soundtrack of new folk songs, fiddle music and field sounds to accompany photographer/filmmaker H. Lee Waters’s video footage of the North Carolina Piedmont region in the 1940s. The images were assembled by film director Finn Taylor and editor Rick LeCompte. The multi-media work was originally commissioned by Duke Performances at Duke University. Waters, who was a longtime resident of Lexington, N.C., spent several years in the Depression going to towns and cities and making short films about the people and places in each place. Water’s films would be shown in local theaters and attract crowds of local people wanting to see themselves and their friends and neighbors in the films. He died in 1997. Tickets for the community are $5-$18 and seating is unassigned. Wake Forest University and Wake Forest School of Medicine faculty, staff and retirees receive free admission for themselves and one guest to each Secrest Artists Series performance. Wake Forest students receive free admission for themselves.